14mm-long squarish ovals with a slight twist. They are 8.5mm wide and 4.5mm thick, with the hole running the length. 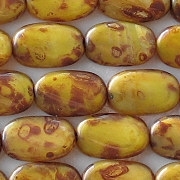 Opaque satiny yellow with a brown picasso coating. 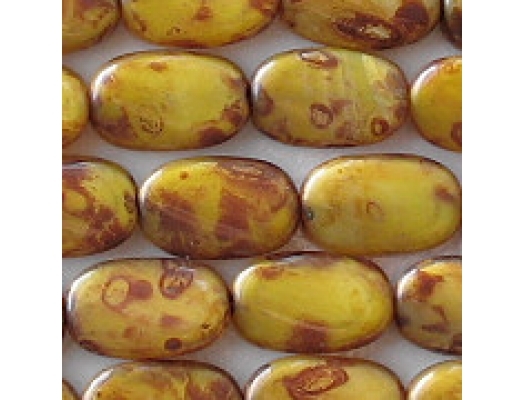 I believe that the inner bead is yellow, although an occasional bead has a whitish area. Please see my comments. Sadly, the new version of these beads is not as nice as the old version – i.e., if you like a heavy picasso coating (as I do). 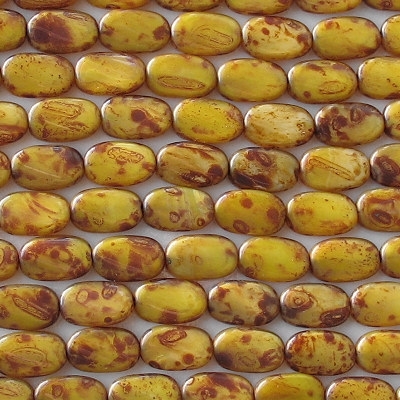 If you like a light picasso coating, then you'll like these new beads just fine. Unfortunately, the supplier's price went up significantly. My older picture, which is smaller, seems better than my newer picture. I'm going to have to think about that! My pictures should be getting better, not worse.